"I’m all about the bling — cha-ching, cha-ching! That’s a joke, yo." What's up, everybody? You know what's up. It is time, once again, to meet the Angry Reader of the Week, spotlighting you, the very special readers of this website. Over the years, I've been able to connect with a lot of cool folks, and this is a way of showing some appreciation and attention to the people who help make this blog what it is. This week's Angry Reader is Hudson Yang. I’m Hudson Yang. I live in Brooklyn New York. I’m ten years old. I’m a boy? I guess I’m an actor. 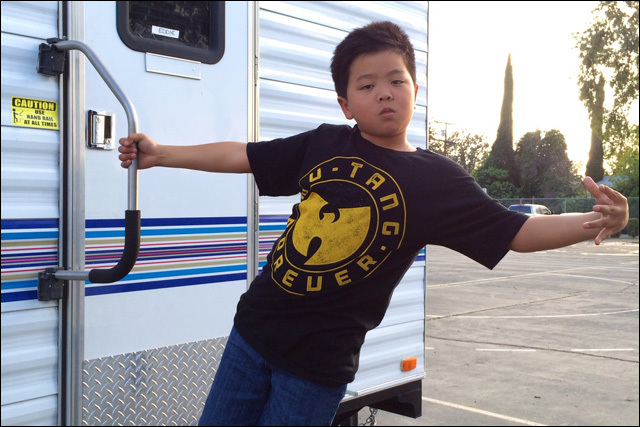 Oh, I’m the lead character in an ABC TV pilot called Fresh Off the Boat! The show is based on a book by Eddie Huang about his childhood, and I’m Eddie. The real Eddie Huang is a producer on the show. He’s really cool. He’s a chef. And he’s really nice — I can relate to him. He makes jokes all the time that make people laugh. He’s really cool and he gets to do things that not a lot of people do, because he travels to a lot of different places for this food show he does. He told me he got to cuddle a panda in China. Shooting the pilot was awesome. I got to walk around the set of Modern Family, which is one of my favorite shows. And Bones — I got to walk around the set of the show Bones. So I guess I’m a lucky kid. Right now I’m waiting at an audition and there are a lot of people ahead of me. It’s for a small role in a movie — the part is "Young Male Friend"! I can do that. Wait, is the question what city? I’m in New York. But if the show gets picked up, then I have to be in Los Angeles. Which is cool because I love Los Angeles. I’m from Brooklyn. My dad was born in Brooklyn too, but my mom is from Taiwan. So’s Eddie! Taiwanese powaaa! A lot of time I’m at school. I go to class. I play dodgeball and soccer and I hang out with my friends. But the big thing is the show — we’re waiting to hear what ABC says about it. We find out this weekend. I’m really nervous because there’s a lot of competition. But the show is really funny. And my mom and dad in the show are great — my mom is Constance Wu, who’s really pretty and sweet, and my dad is Randall Park, who’s so funny and was always taking care of us, even off camera. He did this Internet show called Baby Mentalist that my dad let me watch, which is totally hilarious. You should watch it. I’m all about the bling — cha-ching, cha-ching! That’s a joke, yo. A lot of stuff. War. Also when my brother is annoying! I really love him, but kid, please.